Someone said this the other day “God Keeps His Promises” relating to something totally different than Annabelle, but I latched onto it. The truth is, God has really never PROMISED me Annabelle would be home for Christmas. He has, however, said he would give us the desire of our hearts, and that is one of mine. But an even DEEPER desire of my heart is for Annabelle to get better, stronger, and be safe. The doctor came in this morning, and said that he was worried about sending Annabelle home. They did a pre-home echo yesterday, and while it was unchanged, it still shows that she has significant AV valve regurge, which means her heart is having a hard time bearing the load of its job. Her liver is still significantly distended, which is another sign that her heart is having to work super hard. 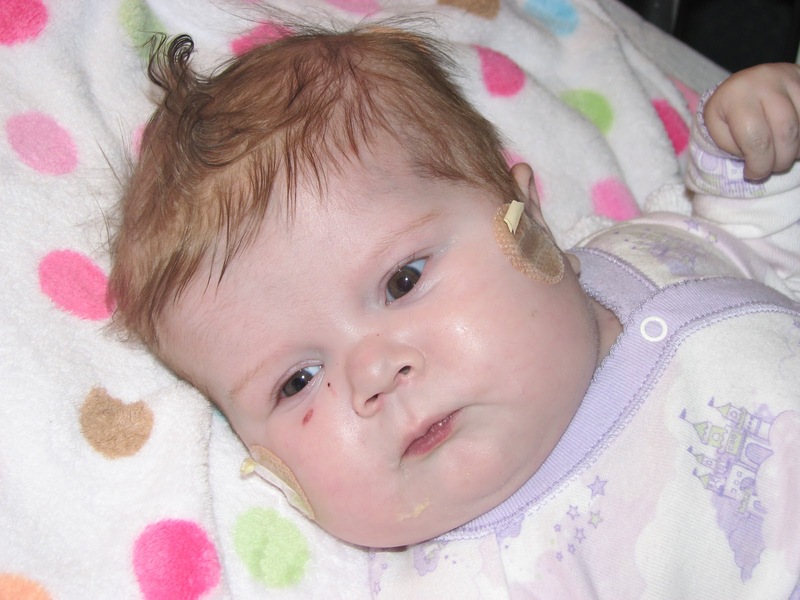 While every baby’s heart works overtime between the Norwood and the Glenn, Annabelle has always had a little harder time than a lot of babies, as evidenced by her 5 month hospital stay. At the beginning of rounds everyday, the attending starts out by saying, “Annabelle is our unbalanced AVSD with hypoplastic left heart who has had a prolonged complicated hospital stay.” She then goes on to list all of her major complications…. multiple cardiac arrests, ECMO, etc. This a reminder daily of what she has come through! *sigh* To put it bluntly, the doctor is afraid to send her home. If we do come home, it will most likely be just a 2 day pass or something similar, say go home on Thursday or Friday and come back on Sunday or Monday. Not ideal… but it’s Christmas. I’ll take it! We live about 45 minutes from the hospital, which while it is far, is better than those people who live 3 to 5 hours away, in which I wouldn’t even consider going home. Personally, I’ve been very involved in Annabelle’s care for 5 months now. I know her signs, I know what to look for, I’ve seen her at her very worst. I feel pretty okay about taking care of her, I really do. But I want this to be God’s decision, not mine. God gift, not my greediness. God’s will, not mine. Right now, doctor says it will be a game day decision. We are going to talk to the surgeon today and make sure he’s okay with the “plan” as well. Your continued prayers are appreciated. I am still having a lot of faith that Annabelle will be home for Christmas. But at the same time, I’m placing my child and our Christmas miracle in the arms of Jesus, where they belong, and knowing that He will make everything work out for good. Okay, thought I’d try something new…. Here is Annabelle playing with her toys and telling you all Merry Christmas! Keeping all of trust in the God who loves Annabelle more than anything and knows exactly what is best – Love you and your family and praying for GOOD THINGS! She is so sweet. I will keep praying for you all. Krista!!!! I love the video! You should try that more often, because it was way cool to see her ANNNDDD to hear your voice! Isn't it funny to have these online friendships and not getting to experience them in the physical? To hear your voice made you seem more real to me, and I love that! I can't wait to meet you in person some day, Krista! I will be praying for Annabelle and for all of you! How precious! Thank you for sharing that video of your cutie pie! And Krista, thank you for allowing us in to see your heart and how the Lord is working in your lives. I agree with Sherrinda, loved hearing you both! Great quality video, btw. Oh, She's so precious! What a little angel! Continued prayers and a very blessed Christmas! I love you, I love you, I love you. Wish I could hug you in person, and pray over little Annabelle, but there is no distance with the Holy Spirit, and Jesus is the healer, so I will trust Him to keep His promises to take care of you and your wee one! I know you are in a "hard" place. We have been praying for so long for Annabelle to be able to make it home for Christmas (even before the doctor gave the criteria of "no more desats"). I admire you being willing to yield this decision to God. It can be frightening at times but we know He knows what is best. His thoughts are higher than our thoughts and His ways higher than our ways (Isaiah 55); however, we are still praying that Annabelle will make it home for Christmas and trusting God with the "yes" or "no" of it. Thanks for the video. She is even more precious than the still photography has showed us. The video is wonderful! What a delight it was to see Annabelle with no oxygen and to hear her cute little sounds. It was great to hear you, too, Krista. Talk about a voice filled with love. My continued prayers are being lifted for you and your family. I pray God will give you ALL the wishes of your heart! What a beautiful baby girl! She was so cute and intent on playing with her toys. Such a blessing: ) I recently came across your blog and have been following for a bit. It was great to see a video of your little girl. I pray your Christmas will be just as God sees fit…with all of His purposes fullfilled. I know that it is difficult sometimes to surrender to His plans. I say this as a mother of a 15month old son who has had open heart surgery also amongst other complications. My heart, my prayers, my thoughts, go out to you and your family during this time and especially during this season. I'm praying right along with you! I am also trusting God with my own son's release date 🙂 We are supose to leave today but I have a worry in my heart that they will say not quite yet. Trusting Him to lead the doctors in the right direction. Andrew has been mostly inpatient since July and had a major heart surgery on the 7th of this month. Just wanted to let you know I can so empathize, and if you think of it pray for my son as well. He has over come so much but we have alot a head of us yet. This was open heart #4 and sternotomy #5 since he was 5. Andrew just turned 21 and God has been faithful every step of the way. What a journey but how much He has taught me. He has a web page at carepages.com his page name is andrewjosephspage, just incase you'd like to see his story. THANK YOU all for your prayers! You all are AWESOME!! !